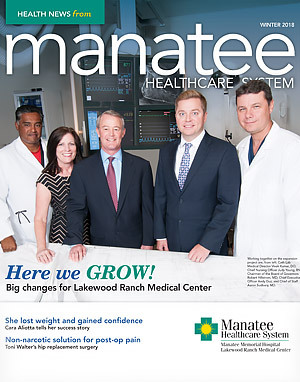 Health News from Manatee Healthcare System is a publication designed to bring you the latest news about Lakewood Ranch Medical Center and Manatee Memorial Hospital, as well as health and wellness information you can use throughout the year. The facility is expected to double in size, allowing emergency personnel to accommodate more patients and streamline care. "Weight-loss surgery changed my life!" Cara Aliotta tells her success story. As the region grows, so does Lakewood Ranch Medical Center. Toni Walter had both hips replaced two years apart. With her first surgery, the medication made her nauseated. For her second surgery, she tried a new option. The difference was like night and day. When the community grows, so do physician practices.